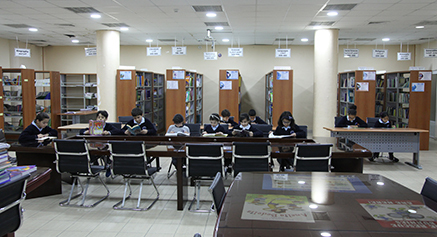 The school library is the informatics haven for all classes, from the kindergarten to the twelfth grade. It uses the latest means of media and information technology. Students visit the library for story time or the books travel to the kindergarten classes to enrich them literature in a familiar and cozy environment. The various services offered by the library include service loan, extension, and provides references and reference books, plus periodicals that arrive at the school. Librarians are always working on improving library services through the provision of information sources and communications to provide space students are happy in between books of knowledge and ideas. Digital space serves for different scientific researches and use of modern office systems. The main sections of the library are general knowledge, philosophy, religions, social sciences, languages, theoretical science, applied science, fine arts, history and geography. Books, references and periodicals are available in various languages including Arabic and English as the majority. Students have the option to borrow a book for a day or as long as a week. They can also book which books they might want on specific dates. Respect should be shown to the library rules while being in it or when borrowing books.